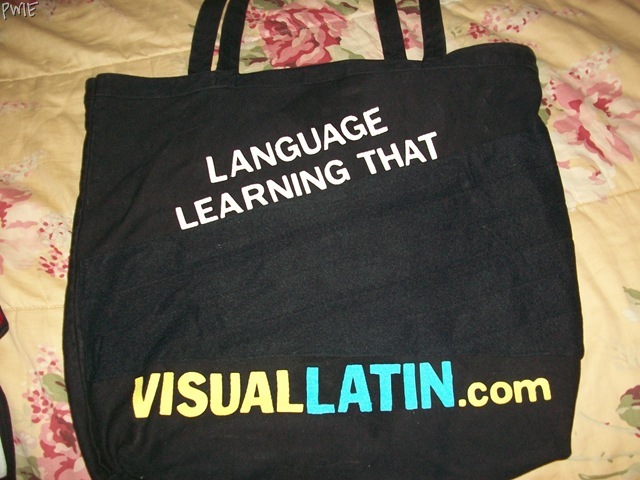 You can read my “formal” review of the Visual Latin courses at The Homeschool Village. I want to break it down to a personal level. I had been looking, searching and picking the brains of my fellow-homeschool blogging moms for their take on the different education methods; you know…Traditional, Text-book, Classical, Unschooling, Montessori, TJEd, etc. Through all of the searching, I kept getting pulled back to Christian Classical Education, but it still seemed far above my head. How in the world would I “convince” my children to follow this model? I L-O-V-E reading and was ready to really dive into reading the classics. My bookcase was filling up super fast with online and used bookstore finds. I own two of the most popular resources in learning about Classical education. I’m still on the quest of educating myself! I came to a section in one of the books about foreign language. Ah! Yes! I’ve been wanting to teach my children either Spanish or French. I learned that Latin is indeed the root of most languages. Sure, I know a few of the kids from when I was in high school that took Latin, but I honestly thought that it was uncool. I mean really…who in movies say, “Say something romantic to me in Latin.”? Even though Latin is considered a dead language, I think that it’s very much alive. Do you know how often we use it?! Still not sure of which way my kids education was going to be directed, I figured that I still needed to get a foreign language in. So, why not? I probably went searching of an “easy” or basic Latin Language curriculum, but what I found was Visual Latin. I watched a sample lesson by Dwane Thomas and then raved about it to my homeschool friends on Facebook! There were a handful that had heard about it and shared in my excitement. I quickly downloaded the free lessons and worksheets. Plopping my two oldest boys (14 and 11) in front of my computer monitor, they slouched and moaned about yet another lesson on the screen. Pretty soon they were answering Dwane back (even though he couldn’t hear them). They were both very enthusiastic about the worksheets too! They’d just heard everything that they needed to successfully fill it all in. Learning how our language derives from Latin piqued all of our interests even more. I want to learn more words and meanings. There was a buzz about an upcoming Blogging conference that I’d been waiting for a whole year to go to; the Titus 2:1 Conference. You’ve heard me talk about it in this post. It was up to God and me to make it happen. I knew that many other conference attendees were reaching out to companies for sponsorship also. THAT was totally out of my comfort zone. I’d gotten ideas from trusted friends on how to approach this or that company. I was shaking in my boots!!! 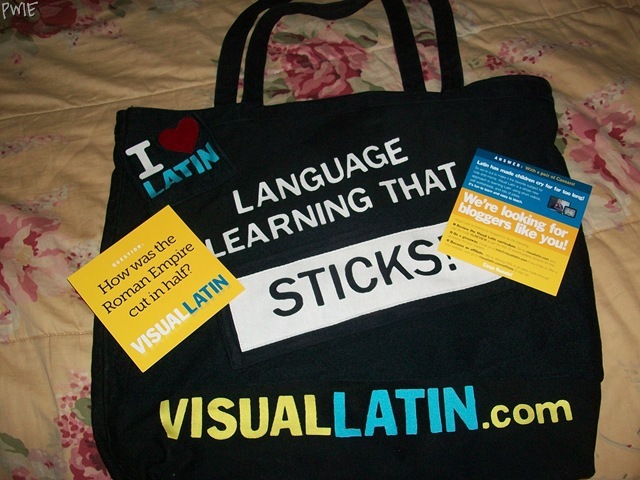 I had a nudge to contact Visual Latin since I’d already posted a review about them at The Homeschool Village. I hem-hawed (you like that southern phrase, don’t ya?!) around for a couple weeks. Every morning that I woke up, it was literally one of the first of my thoughts! I was letting fear of rejection paralyze me. I wrote the email to Visual Latin with my eyes closed tightly, hit the send button and sat dazed for several moments. My husband was the first one that I called when I got the first response from Visual Latin saying that they were interested and wanted more information. Talk about A1 customer relations! Mr. Purifoy was a delight to talk with through email and over the telephone. He went above and beyond everything that I’d asked for. When I arrived at the host hotel for the conference, there was a package waiting for me there with the cards and a crazy cool velcro laden tote bag. 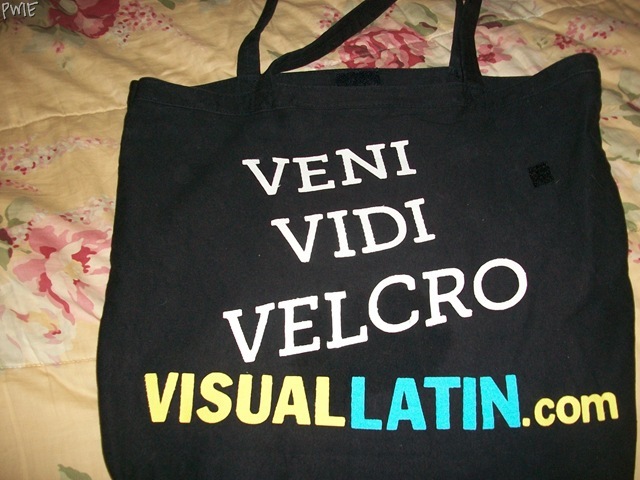 The tote bag and what Visual Latin had to offer (10 free lessons to bloggers in exchange for a review) was a hit! I’m totally thankful that the gracious folks at Visual Latin invested in this blogger and I look forward to working with them more in the future! Want your kids to LOVE learning Latin?